This is for your Spanish knight! Live performance of the Trio 'Los Payos' with the Singer and Guitarist René el Payo, his Son Rouven and the Haitian Philippe Fiotte at the Cajon. 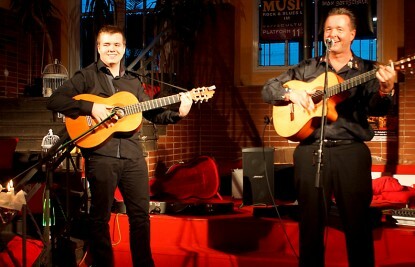 Atmospheric Live Music with the Hits of the Gipsy Kings such as Baila me, Volare or Bamboleo, South American Songs such as Besame mucho and Guantanamera and Also chart hits such as Despasito or Bailando by Enrique Iglesias Are offered. The Trio ' Los Payos ' plays the music from the Camargue of St. Marie de la mer authentically with their Guitars-live and without Music samples: A real Firework of Spanish-Southern French Rhythms and Melodies.